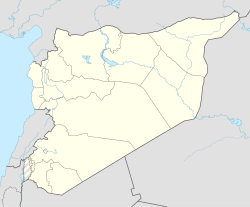 Abu Kamal or Al-Bukamal (Arabic: البوكمال‎) is a city on the Euphrates river in the Deir ez-Zor Governorate of eastern Syria near the border with Iraq. It is the administrative centre of the Abu Kamal District and the local subdistrict (Abu Kamal Subdistrict). Just to the south-east is the Al-Qa'im border crossing to the town of Husaybah in the Al-Qa'im District of Iraq's Al Anbar Governorate. During the Ottoman time, Abu Kamal was called kışla, pronounced locally as "qashla", which is a Turkish word for "military barracks". This name "Qashla" is still used by some inhabitants of the area, especially by elderly villagers. The name "Al-Bukamal" (Arabic: البوكمال‎) means "the family of Kamal", Kamal being the tribe that lives there, whereas the name "Abu Kamal" means "the father of Kamal". In the 17th century, Abu Kamal was the seat of an Ottoman sanjak in the Eyalet of Ar Ruha, modern Şanlıurfa. It was a kaza (subdistrict) center within Zor Mutasarrıflığı (District of Zor) until the end of Ottoman rule in 1918. In 1896, the old mud village was relocated a mile upstream because it was in danger of being ruined by flooding. The new village was built from stone and had wide streets. The village and its subdistrict formed the center of the Arab Uqaydat tribe and was largely Sunni Muslim, with the exception of a small Christian community from Deir ez-Zor and Mosul. At the beginning of the 20th century, it contained eighty houses, the residence of the kaymakam (kaza governor), a police station, a ferry, and had a population of about 500. The kaza of Abu Kamal in 1890 a population of 15,000. France occupied Abu Kamal together with Deir ez-Zor in 1921 and made it the seat of a large garrison. In 1946 it became part of independent Syria. The region's position at the border of Syria and Iraq, especially after the US invasion of Iraq, has made it an important commercial as well as political center. During the Syrian Civil War, in late July 2012, the FSA took over the town, along with its associated border post with Iraq. In early September 2012, France 24 reported that the Hamdan military airport was under attack by FSA. On 16 November 2012, FSA took over the nearby Hamdan military airport, which was once used to transport farm produce, but was converted to a base for helicopters and military tanks. The capture of Hamdan meant that the Syrian Army forces now only held one air base in the province - the main military airport in Deir ez-Zor city. Abu Kamal would later be captured by the ISIL between late-June and early-July 2014 during a three-month offensive across Deir ez-Zor Governorate. On 3 July 2014, SOHR said that city of Mayadin, the second biggest town in Deir Ezzor province, was also "now under IS control, after Al-Nusra Front evacuated its headquarters there, and IS raised its banner". On 3 July 2014, all towns and villages on the route from Abu Kamal to Al-Bab, passing through the Raqqa province, were under Islamic State control. Owing to its distance from the frontline, the town would see little fighting between its capture by ISIL in 2014 and ISIL's retreat in 2017. During the lull in conflict, the town was the target of a failed opposition attack by the US-backed New Syrian Army in June 2016; the offensive lasted only a day and led to a total reversal of New Syrian Army advances to Abu Kamal. On October 14, 2017 the Syrian Arab Army took the city of Mayadin, located 80 kilometers from Abu Kamal. After that Abu Kamal was the only large city that remained under control of ISIS. On October 25, the road Al Qaim – Abu Kamal – Mayadin – Deir ez-Zor was blocked after a series of airstrikes conducted by Russian Air Force. From 1 to 4 November 6 Russian Tu-22M3 strategic bombers conducted airstrikes on ISIS objects near Abu Kamal. On November 7 the SAA started operation to take Abu Kamal with support of allied forces, like the Iranian-backed Hezbollah and the Iranian Revolution Guard Corps (IRGC). “Units of the 5th Assault Corps, assault groups of brigadier general Suheil and militias with support of Russian Air Force took part in liberating Abu Kamal. In the final stages of hostilities the Syrian Arab Army gained control over the Syrian-Iraqi border near the Euphrates River”. On November 11, the city was however recaptured by ISIL. The Syrian Army and its allies retook complete control of the city by 19 November. Concerns have been raised about what would happen to the village once ISIL was removed. Abu Kamal has a hot desert climate (BWh) in the Köppen–Geiger climate classification system. Saddam al-Jamal An Islamic State in Iraq and the Levant leader. ^ a b c A Handbook of Mesopotamia, Volume III: Central Mesopotamia with Southern Kurdistan and the Syrian Desert. Admirality and War Office, Division of Intelligence. January 1917. p. 120. ^ "BBC NEWS - Middle East - 'US helicopter raid' inside Syria". Retrieved 19 May 2016. ^ "BBC NEWS - Middle East - Syria hits out at 'terrorist' US". Retrieved 19 May 2016. ^ Solomon, Erika (Nov 17, 2012). "Syria rebels say seize airport near Iraqi border". Reuters. Retrieved Nov 17, 2012. ^ "Profile: Islamic State in Iraq and the Levant (ISIS)". BBC News. Jan 6, 2014. Retrieved Jan 13, 2014. ^ "IS Takes Over Towns, Countryside in Oil-Rich Syria Province: NGO". NDTV.com. Retrieved 25 October 2014. ^ "Syria Iraq: The Islamic State militant group". BBC News. Retrieved 19 May 2016. ^ Editorial, Reuters. "Islamic State loses al-Mayadeen in eastern Syria - military source". U.K. Retrieved 2017-11-20. ^ "Russian Tu-22M3 Bombers Once Again Struck ISIS Near Syria's Al-Bukamal (Video)". 2017-11-04. Retrieved 2017-11-20. ^ "'Isis is finished': Syrian army declares end of terror group". The Independent. 2017-11-09. Retrieved 2017-11-20. ^ "Russia forms " Anti-Suicide Vehicles " units in Syria , Mod. - Muraselon". Muraselon. 2017-11-10. Retrieved 2017-11-20. ^ "ISIS retakes Albukamal after Syrian Army fails to secure city". AMN - Al-Masdar News | المصدر نيوز. 2017-11-11. Retrieved 2017-11-21. ^ "Latest map update of southeast Deir Ezzor". Al-Masdar News. 2017-11-19. Retrieved 2017-11-21. ^ Gutowski, Alexandra N. (August 10, 2018). "Is the Pentagon About to Hand Iran a Major Border Crossing?". Real Clear Defense. Retrieved August 10, 2018. ^ "Abu Kamal Climate Normals 1961–1990". National Oceanic and Atmospheric Administration. Retrieved April 26, 2017.